HP 20b Business Consultant comes with a LARGE 2 lines display that can view up to 12 digits with number comma separators. HP 20b has a visual scroll through variables, real-text labels, menu and prompts. Frequently-used business functions: TVM, Bonds, Depreciation, Cash Flows, NPV and IRR. Interest Conversion: Solve for any variable like periods per year, nominal or effective interest. Powerful statistics functions: More than 15 statistical analysis functions including six statistical models (Linear, Logarithmic, Power, Base e exponential, Base a exponential, Inverse), standard error and covariance. Easily switch between time-saving RPN and traditional algebraic (chain or hierarchical) data entry. Scroll Keys allow you to navigate through menu lists, variables, recent results and more. Dedicated Math Key for commonly used math functions. Powerful math library including trigonometry, hyperbolic and advanced probability functions. In addition, the HP Business Consultant is the only financial calculator in its class with four advanced probability distributions: normal distribution, Chi-squared, student distribution and F-distribution. HP 20b is suitable for real estate, accounting, banking, finance, insurance, business subjects. Memory: Stores up to 50 memory slots for cash flows or statistical data items, plus 10 storage memory registers. Built-in Languages: English, French, German, and Spanish. LCD Display: 2 lines alphanumerical with adjustable contrast. First line: 8 characters scrolling display + 11 indicators. Second line: 12 +3 digit display that can be easily configurable display format. Unit Size: 14.92 X 7.70 X 1.6 cm. Unit Weight: 113.2 grams. Entry-system logic: RPN & Hierarchical Algebraic or Chain Algebraic. Power: 2 x CR2032 Battery. Materials Enclosure: ABS. Plastic Key Top: ABS Plastic. Processor: Fast Atmel 30MHz, low-power consumption per calculation with AT91SAM7L128 ARM7 System with 128KB of internal FLASH program memory on chip. The electronic circuits powering up only when needed, and shutting off when not needed. Financial/Business Functions: TVM (loans, savings, leasing); Amortization/Depreciation; List-based cashflow analysis; Cashflows; IRR, NPV, NFV, NUS, Bond price, yield and accrued interest; Interest conversions; Percentage calculations; Date calculations; Break-even analysis. Statistical and Mathematical functions: List-based, 1 and 2-variable; Mean, standard deviation; population deviation, standard error; Forecasting, correlations and covariance; +, -, X, %, 1/x, +/- , scientific notation, n!, combinations, permutations, rounding, random numbers, LOG, LN, 10x, PL, square root, Trigonometry, probability. 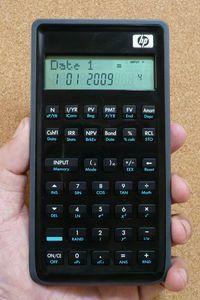 What is in the HP 20b box: Calculator with batteries, and user guide. Quick Comparison of HP 20b with other HP Financial Calculator Models. Tagged By: HP 30b, Sleek, Modern HP Calculators Redefine Style and Usability, HP 20b Business Function - Cash Flows, HP Calculators Timeline.